The digital real-estate industry is a mature market with large players including Zillow, Trulia, and Redfin. REX, a startup in California, is looking to be a disruptor removing real-estate agents from the process and digitizing it wherever possible. When I joined REX they had a live site but were experiencing struggles with engagement and conversion. A quick audit revealed inconsistent styling throughout the site but more importantly a loosely designed conversion funnel. My first task was to strengthen the funnel starting with a new landing page for home sellers. 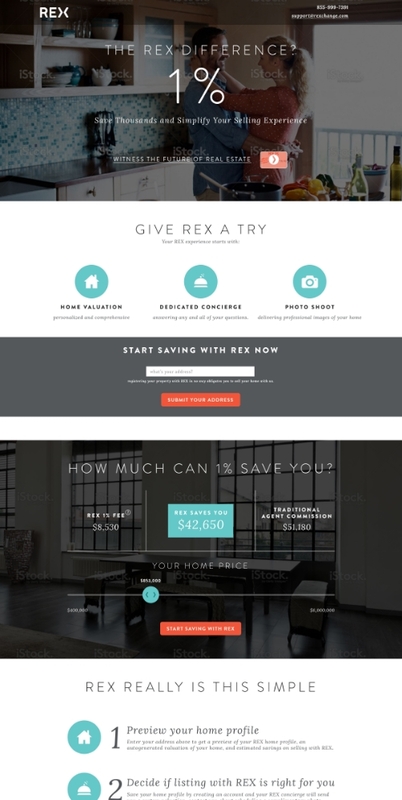 The new landing page for REX. After the landing page’s overwhelming success I was asked to take a look at the design for our property listing page, a core design to the overall brand and experience and the top of the funnel for home buyers. Timelines and budgets didn’t allow for usability testing or user research so I turned to competitive analysis. Through competitive analysis I was able to quickly identify why design choices were made on competitors sites, how those choices aligned with their business models, and borrow from those designs that would benefit REX. I was also able to find ways to set our design apart from the competition. Competitive analysis on the leaders in digital real estate. Now that the top of the funnel for both home buyers and sellers was set in place we shifted focus to the middle of the funnel; providing both user types with more information about REX and the home buying/selling process we were offering. But how do you provide two different user types with very different sets of information? And keep in mind that both user types will eventually transition to the other so there is interest in the other side of the process. Two simple buttons that allow the user to self-identify and toggle. I decided a single “How REX Works” page was the answer. The main path to this page was from two prominent callouts on the homepage asking users to self-identify with one side of the process. Once on the “How REX Works” page, a toggle aloud them to quickly see both sides of the process. The overall structure was similar for the two pages allowing users to quickly compare and contrast both sides of the process. A simple toggle button that swaps content. The more granular details were organized under three tabs in an FAQ. Our FAQ page included tabs so users could self identify for easier access to answers. Over the course of the site redesign we were able to see people transition from beginning to grasp REX's business model and value proposition to clearly moving through the funnel and converting. The designs left REX with a solid conversion funnel to further iterate on. User centered design gained enough support during my tenure that on my last day there I was able to conduct REX's first internal usability test on a feature prototype! Over the process I learned an immense amount about designing for an early stage startup, particularly the importance of atomic design and how to create a system that can be implemented across an experience. An even bigger lesson was learning the value of clearly defining those parts of a design that are critical to the experience and fighting for them, while letting those parts that are “nice to have” slide.